Report: Do Low School Accountability Grades Drive Teachers Away? A new working paper from NBER asks, does holding schools accountable for student performance cause good teachers to leave low-performing schools? The answer: Nope. A research project by a University of Chicago Assistant Professor of Economics found that accountability can lead to positive effects when it's "high-stakes" enough to motivate schools to change and when principals are "good leaders" and have the leeway to implement changes. Researcher Rebecca Dizon-Ross analyzed data provided by the New York City Department of Education, which assigns accountability grades to schools based on student achievement. Frequently, as Dizon-Ross pointed out, systems that hold schools accountable for student performance could make it tough for the low-performing schools to recruit and keep good teachers. 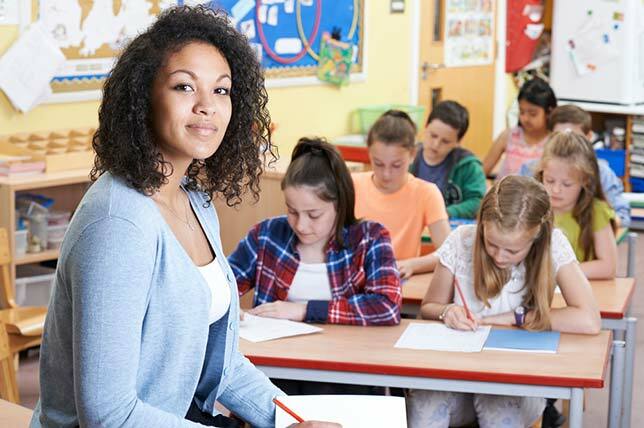 Since high-quality teachers have proved in other research to improve the long-term outcome for students in terms of their educational achievements and life-long earning power, the loss of these teachers could turn out to have "lasting, negative implications" for students at those low-performing schools. Some opponents of accountability systems have even suggested that poor accountability ratings could start those low-performing schools "down a negative quality spiral," in which the great teachers leave, followed by the departure of the best students, motivating more teachers to leave and so on. Using data from the first two years of the New York accountability system, Dizon-Ross found that "accountability pressures" can actually improve teacher retention and recruitment. Specifically, she reported, at the bottom end of the school grade distribution (the C/D and D/F thresholds), where you'd expect the accountability sanctions to have more "bite," as she called it, schools that received lower accountability grades early in the school "decreases teacher turnover at the end of the year by three percentage points." She called this a "large effect," representing about 20 percent of baseline turnover. She also found that principals at schools with lower grades "put more effort into making the schools better places for teachers to work or into attracting and retaining high-quality teachers." They make the management changes that appeal to teachers. As Dizon-Ross wrote, "At the bottom end of the grade distribution, teachers at schools that received lower accountability grades at the beginning of the year gave their principals higher leadership ratings at the end of the year than teachers at higher-graded schools, agreeing more strongly with statements such as 'the principal is an effective manager who makes the school run smoothly' and 'I feel strongly supported by my principal.'" The same positive effects didn't surface for schools at the top end of the grade distribution -- those receiving A/B or B/C grades — when they received lower grades. Dizon-Ross suggested that "accountability pressures" are higher in those low-graded schools, motivating the "positive changes." However, she speculated, those changes are more likely to occur "in settings where principals are good leaders and have the latitude to implement positive changes." The working paper is available in digital form for $5 on the NBER website.